We’ve been delighted by the ways teachers have used Activity Builder to spark, capture, and discuss student thinking. To further support those efforts, we now offer multiple choice (in three flavors!). 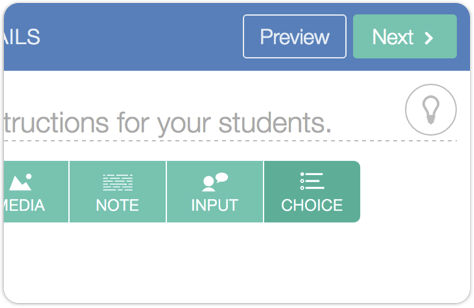 From choose-and-explain to simple-choice to multi-select, we can’t wait to see how you’ll use these new features. Get started with the video on the right, then check out the brief overview below. To get started, select choice from the component menu. Choose from three styles of multiple-choice questions. Draw out student thinking with choose-and-explain. After making a selection, students offer their rationale. Use the histogram view in the teacher dashboard to check for understanding and facilitate class discussion.